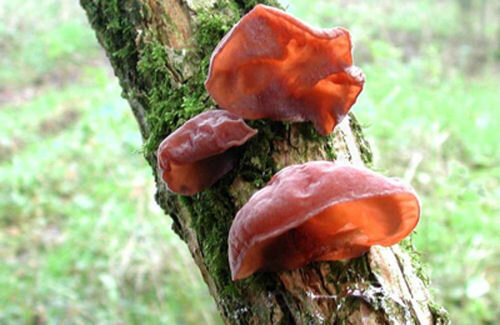 Jews Ear is a rubbery ear-like fungus that is also known as Judas's ear fungus, or as the jelly ear fungus. 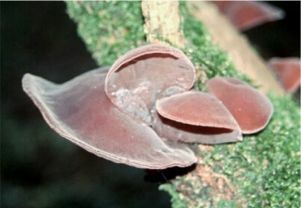 This fungus is conspicuously ear shaped, ranging from purple to dark brown or black in colour with a rubbery texture, and most often found on dead elder trees but also on elm and beech trees. It was said that Judas, the apostle who betrayed Jesus for 30 pieces of silver, hanged himself on an elder tree, which is the origin of the name. This intriguing name stuck, as the taxonomic name Auricularia means ear and the epithet "auricula-judae" means "the ear of Judas." It is pale brown in colour, and really does resemble a human ear in size, shape and texture. Generally it is about 6 cm across. When young it is gelatinous and pliant, but as it gets older it goes black and hard. The spores are white and it grows singly or in groups on old wood. There are no poisonous species that it would be confused with. It is one of the few fungi that has the ability to withstand freezing temperatures. This is a useful attribute, since it develops new growths in January, which is normally the coldest month of the year in Britain. It can actually freeze solid, and when thawed out shows no ill effects. It can be found all year long. It is found throughout Europe, Asia, the United States and Australia. This species is used often in Asian cooking because although it lacks a strong taste, it absorbs the flavours of other foods and provides delicate texture in Chinese and Japanese dishes. Signatures, a theory popular in Europe in the 1800's, plants and fungi resembling certain parts of the body could be used to treat ailment of that part of the body. Since the fungus resembles the folds of the throat, Auricularia boiled in beer, milk, or vinegar was used to treat throat ailments. Because its gelatinous consistency could bind eye medicine, it was also often used as a salve to treat eye ailments. that ingesting Auricularia regularly in small doses can be therapeutic in preventing strokes and heart attacks. Other therapeutic uses of Auricularia from modern medicine include lowering blood cholesterol and triglycerides. There is even some evidence it can play a role in treating diabetes They have also been found to have antitumour, cardiovascular, antiviral, antibacterial and antiparasitic effects. Put the Jews Ears in a small bowl and cover with boiling water. Let stand for 30 minutes to rehydrate. Drain and rinse the Jews Ears; discard any hard clusters in the centres. Heat the oil in a wok or large pot over medium-high heat. Add the ginger, chilli paste, Jews Ears, bamboo shoots, and pork; cook and stir for 1 minute to infuse the flavour. Combine the soy sauce, vinegar, salt, pepper, and sugar in a small bowl, pour it into the wok and toss everything together - it should smell really fragrant. Pour in the Chicken Stock, bring the soup to a boil, and simmer for 10 minutes. Add the tofu and cook for 3 minutes. almost immediately.) Garnish the hot and sour soup with chopped green onions before serving.